Over/Under: Over 154.0 at 1.90 Bet Now! Both of these teams hold a 16-11 record in the Euroleague so far this season and more importantly, both teams have booked their place in the next stage of the Euroleague tournament. This should be a game with plenty at stake as a win here will give the victor an improved chance of moving up the table and it could also provide a psychological blow when it comes to gearing up for the playoffs. There is a great deal of history between these sides and this game is going to be their 21st clash in European competition. The teams have both won 10 games each so whoever comes out on top in this game will have the slight advantage between these sides. 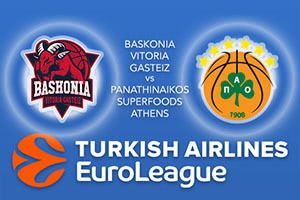 It was a close run thing when these teams met the last time, with Panathinaikos winning by a score of 69-68. Chris Singleton had a big game that night, grabbing 23 points and if he can deliver the same sort of showing in this game, it could be a fun night for the away side. Shane Larkin will be keen to ensure that he and his team-mates have a positive night and Larkin has chipped in with an average of 13.1 points per game this season. Larkin has been ably assisted by Rodrigue Beaubois, with an average of 12.1 points per game and Toko Shengelia, who has offered an average of 11.5 points per game. If these players combine on Thursday night in the manner we all know they can, it could be a thrilling night for the Spaniards. The Greeks have a former Baskonia player in their ranks, and Mike James has delivered this season. James has provided an average of 12.8 points per game this campaign and he has been backed by the 12 points per game offered by Singleton while KC Rivers has chipped in with an average of 11.3 points per game. This match could go either way but back Baskonia Vitoria Gasteiz at -5, which is provided at odds of 1.90. If you’re looking for the Over/Under market, go OVER 154.0 which is on offer at odds of 1.90. Bet Now!